The SUV that really put the Sports into the Utility Vehicle, think what you like about the Porsche Cayenne it's something of a landmark car. The SUV that really put the Sports into the Utility Vehicle, think what you like about the Porsche Cayenne it's something of a landmark car. Not just for the class of car it competes in, but for Porsche, the sports car firm's existence owing a lot to its decision to build the Cayenne. So while the purists baulked, the Cayenne sold in huge numbers, it outselling its 911 and Boxster relatives, confirming Porsche's decision to build it as the right one. Its styling might have taken some getting used to, but despite its somewhat uncomfortable looks customers couldn't get enough of them. Porsche's sporting roots shone through in the driving experience too, the Cayenne redefining performance and handling in tall, big 4x4s. Introduced to a muted response from Porsche's traditional customers, even they couldn't ignore the performance that the Cayenne offered. Initially available in Cayenne S and Turbo guises, both are V8 petrol engines of 4.5-litre capacity, the Cayenne S boasting a not insignificant 340hp, the Turbo boosting that to 450hp. That was enough to allow the Cayenne S deliver a 0-100km/h time of 7.2 seconds, and the Turbo a scarcely believable 5.6 seconds. With all that power came a chassis more than able to exploit it too, the Cayenne's handling more like a super saloon's than a high-riding SUV's. Porsche cannily built the Cayenne in conjunction with Volkswagen, the big SUV sharing a great deal of its structure with the Touareg. The differences are obvious on the road, the Porsche being the more overtly sporting model, though interior space in both is all but identical. Manual transmissions were standard on the Cayenne S, the later Cayenne V6 and the Cayenne Diesel, though it's unusual to find Cayennes that haven't been specified with Porsche's six-speed Tiptronic automatic transmission. The V6 Cayenne was criticised for being too slow to wear the Porsche badge, while the 240hp Diesel made up for its relative lack of power with ample torque. Again, these two models proved the critics wrong, being big sellers around the world. The GTS was introduced late in the Cayenne's lifecycle, it reviving a sporting badge from Porsche's history, adding stiffer suspension, a standard manual transmission and 405bhp output to the Cayenne's specification. Mid-life revisions across the range saw all gain more power, better economy and improved emissions; these also signalled a slight facelifted design with re-profiled lights front and rear, new bumpers and mild interior revisions late in 2008. The base V6 grew in capacity from 3.2- to 3.6 litres while the Turbo S is the range flagship, delivering a 542hp output and sub-5.0-second 0-100km/h time, though its colossal price was matched by its price, making it a rarity here. Buy on budget and running costs. The occasional Turbo or Cayenne S might be available for relatively sensible money, but they're not cheap to fuel, tax and insure. The V6 makes far more sense, particularly the later 3.6-litre model, which benefits from improved power and efficiency. It's the one we'd pick. 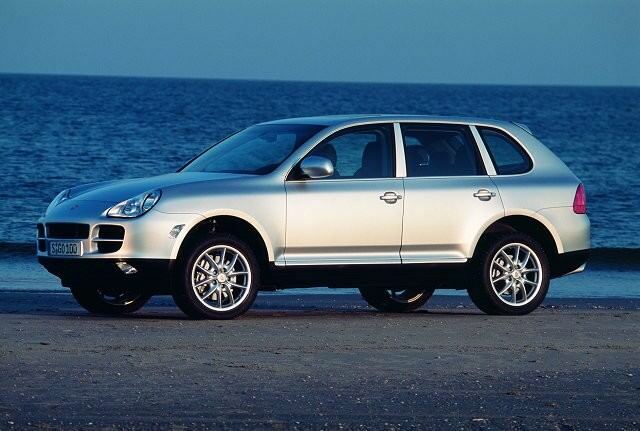 It might have upset 911 owners, but the fact Porsche remains as a viable company has a lot to do with the Cayenne. The first credible sports utility vehicle that really put the emphasis on sports, the Cayenne drives every bit as well as the badge on its oddly styled front promises.